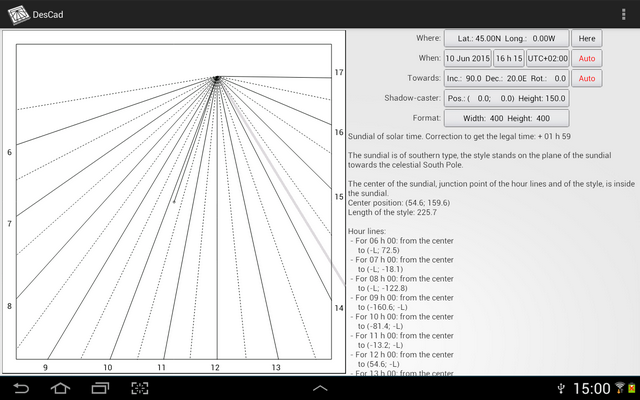 DesCad is an application which allows you to simulate a sundial corresponding to the screen of your smartphone or tablet. Depending on its orientation, DesCad draws in real time all the hour lines and reproduces the shadow of the style according to the current time and date. DesCad runs on smartphone and tablet Android version 4.0 or higher. 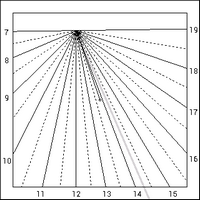 Dimensions of the real sundial, the quantified data allow you to materialize it. The position / size of the style and the date / time of the shadow can be modified by gestures on the touchscreen. The application has therefore a great educational value for those who are interesting in sundial, from beginner to expert in gnomonic. Turn slowly the smartphone or the tablet on the three axes: 2 to 3 revolutions during about 10 seconds per axis. The calibration is finish. 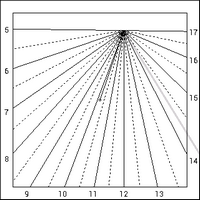 The parameters of the sundial orientation (inclination and declination), which are computed and supplied by DesCad from the magnetic sensor, are then less erratic and more accurate. However, the accuracy is not better than some degrees. Click on the button corresponding to the parameter to be modified. An input box then appears to capture the parameter. - If the edge is black, the position and the size of the shadow-caster are modifiable. Use the touch and drag for the position, separate or close two fingers for the size. - If the edge is red, the time or the date will change depending to the direction of the drag. To change the color of the edge, click on the sundial. The menu allows you to access save functions, configuration of the sundial lines and type of shadow-caster. When the shadow-caster is Visible, it is drawn lied on the dial surface. The quantified data allow you to reproduce the sundial in real greatness. The different points of the dial are given by couples of coordinates (x; y). 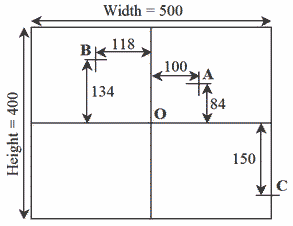 The coordinates are defined relating to a reference centered on the dial surface. The enabling of the squares by menu shows this reference. When one of the coordinates corresponds to the edge of the dial, it is replaced with L or –L. The two points of their extremities define the segments of straight line. Despite all the care taken to verify this program, it is possible that some bugs have escaped my attention. If you find any malfunction, do not hesitate to let me know: I shall endeavor to make the necessary changes. I will also be very attentive to proposals from users for improving the program if they express a particular need (yvon.masse sfr.fr).